This is an ongoing meditation on the process of adopting a child. I’m mostly through the logistical and ID hoops and mountains of paperwork. Soon I’ll be in the “pool” of eligible adoptive parents. Last night was my third of four workshops through my agency. This time an amazing mother brought her four teen-aged daughters. Who were adopted — two as babies, the other two at 15 and 12. And they couldn’t have been more gracious and funny and smart and like regular sisters, alternately picking and snuggling up on each other. Except they were born to Jewish, African American, El Salvadoran and garden-variety white women, and didn’t look a speck alike. We heard all their stories of love and horror. And each one of us prospective parents in the room, I swear, were bowled over by their charm and grace and bravery. It struck me so good and true and — possible. So yes, I am considering taking an older child as my own, with eyes wide open to a whole new layer of complication. 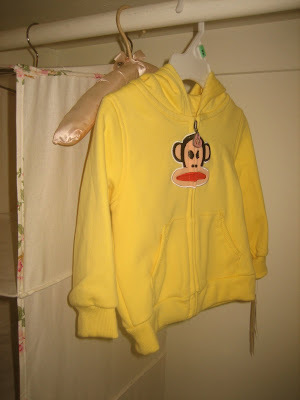 We might have to give away the Paul Frank baby hoodie, the only thing I’ve bought so far in anticipation. Oh, Vanessa, how I love you. You’re brave and honest, and will make such a wonderful mother to any child lucky enough to find you. I read a blog at Yarn Harlot ( http://www.yarnharlot.ca/blog/archives/2009/08/31/a_problem_in_the_wiring.html )after I read yours (you’re always my first blogging stop). It made me totally weepy and smiley at the same time. It made me think of you and our futures as parents. I love this post. Keep the hoodie. Even if you do adopt an older child, you might still need baby clothes some day. 🙂 So much love to you.